Last week, the folks from Carić Winery posted a really nice picture on their Facebook wall of Svirče and the lavender growing wild around it. It was quite pleasing and made us want to go back through the photos from our last visit when we were researching the Hvar wines (which you can read about more in depth in our Dalmatia guide). Hvar gets a tremendous amount of good press for its inherent beauty and it’s definitely true that sipping on a glass of Plovac Mali (local dialect for Plavac Mali) while looking out from Hvar Town (above) is enchanting. 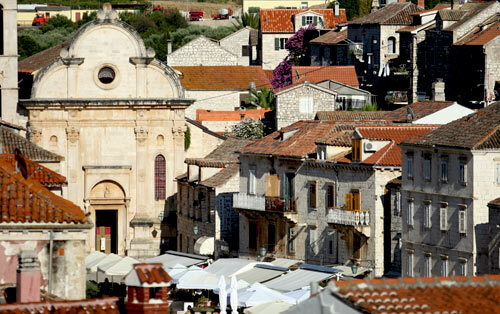 It’s also great to wander the stone buildings of the old town, which you can see below. Often skipped is Jelsa (below), where we stayed during our trip. There are wineries there like Tomić’s Bastijana as well as smaller wineries. 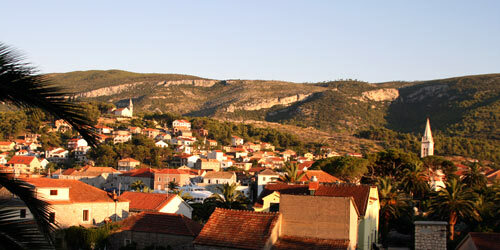 It’s an overall quieter town that many might prefer given that Hvar Town can get quite rowdy at the peak of beach season. The only downside is the incredibly early morning (05:00) ferry from Jelsa which can be made an even more painful morning if a Mišo Kovač concert was playing loudly the night before. Despite the scheduling, this ferry is quite crucial though as it connects people to Bol on Brač as well as back to Croatia’s ferry hub on the mainland of Split. To everyone headed to Hvar this summer, all of this awaits you and we have to say that we’re just the slightest bit jealous. Make sure to drink as much Plenković Grand Cru as you can while there and grab a copy of the guide if you want more information on the wines!